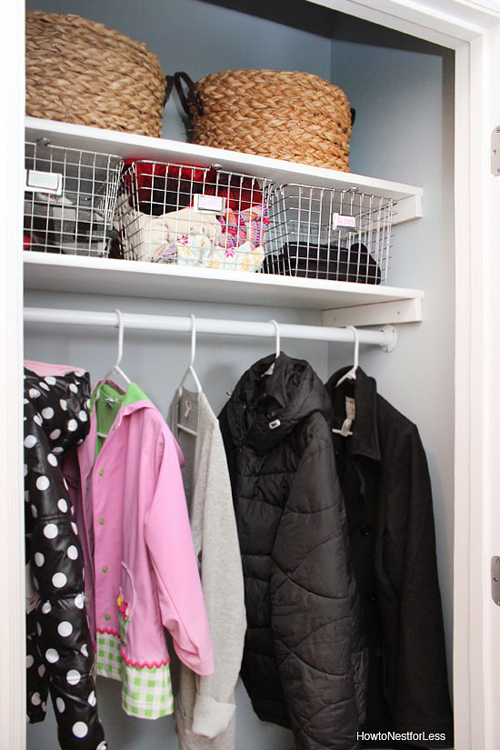 Sweet and simple organizing paired with a dash of color and you have the perfect combination for a clutter free coat closet. Not bad right? But it had real potential to do more! 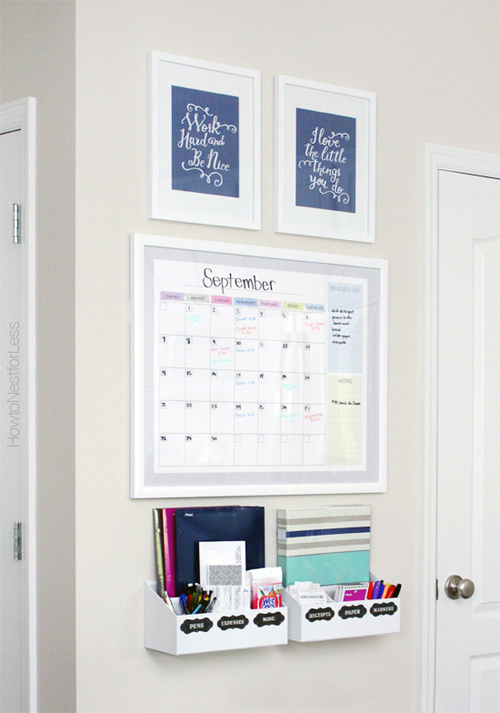 I asked Erin to stop by today to share her tips on growing that closet space without removing any walls. Here she is now! 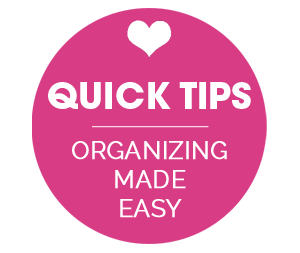 "The main function of this space is to stay organized this winter season. This coat closet is just off the garage, the entry we use most often into our home. I wanted a smarter space... a place to organize our coat, shoes, mitten, gloves, purses and more." "Get into the habit of using it properly every single day. We take off our shoes once we enter the home, especially in the winter months with icky snow and ice salt. 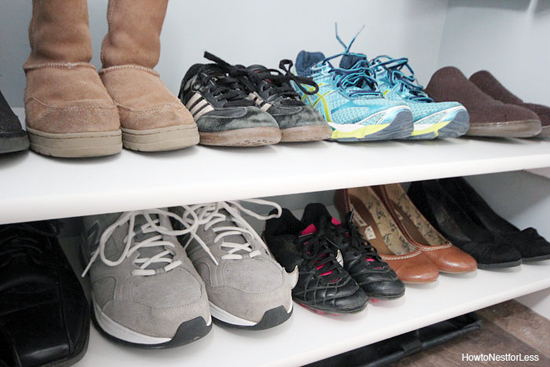 The shelves are a great way to keep the shoes organized and easy to find during the morning rush. The hardest part was remembering to hang my purse on the hooks everyday, but now I'm not searching around the house for it! Just remember, practice makes perfect. And make any adjustments if you find that something isn't working for your family!" 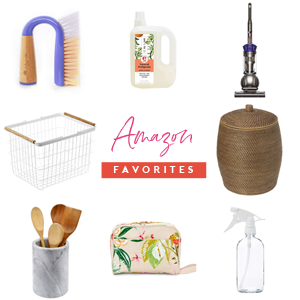 What items were essential while organizing the space, and why? "The shelves were the biggest deal in my book! I was so sick of the basket method, having to dig around each morning to find a matching pair of shoes. I'm also a huge fan of the hooks on the back side of the door!" "I love that we painted the inside of the closet. To be honest I've never done that before. Now I love opening the door and seeing a pop of color! 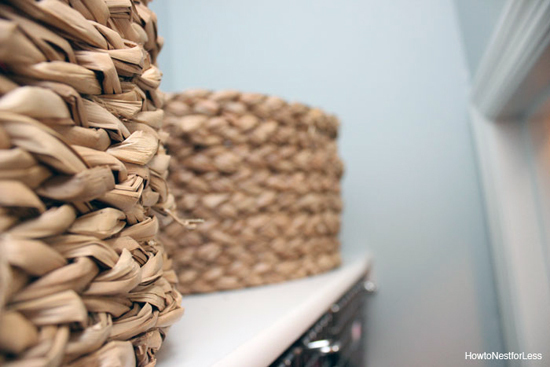 I also love the mix of the woven and wire baskets." "I was actually shocked at how affordable this project really was. Just a couple boards for the shelves, some hooks, a couple baskets, a new rod... easy peasy!" 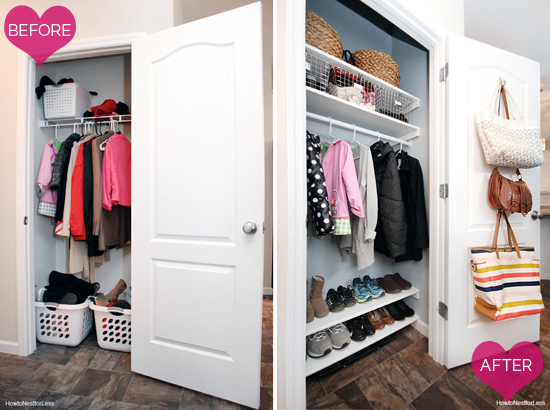 "I'm seriously in love with this coat closet makeover. It's all about function and organization. It can be frustrating when you spend time on a home DIY project and it doesn't really jive with your family's needs. Luckily this one was perfect. Anything that helps my family get out the door quicker in the mornings is a big win in my book!" Erin did a really lovely job maximizing the space and by just making a few tweaks to her previous setup, she was able to gain so much more use and storage out of her standard sized closet. 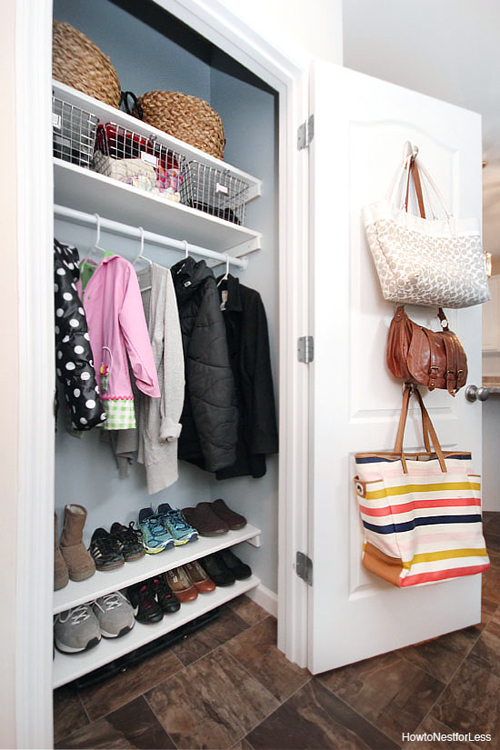 Simple additions such as shelves and command hooks is something that anyone can do; if you live in an apartment, consider using inexpensive shoe shelves by Closetmaid. Of course, my heart totally smiled seeing that she painted the interior of the closet, and it smiled even bigger when she mentioned that is really does make a difference in the end result. There really is something special about opening a drawer, cabinet or closet and breathing a sigh of sweet relief. Another kudos to Erin for utilizing the back of her door. 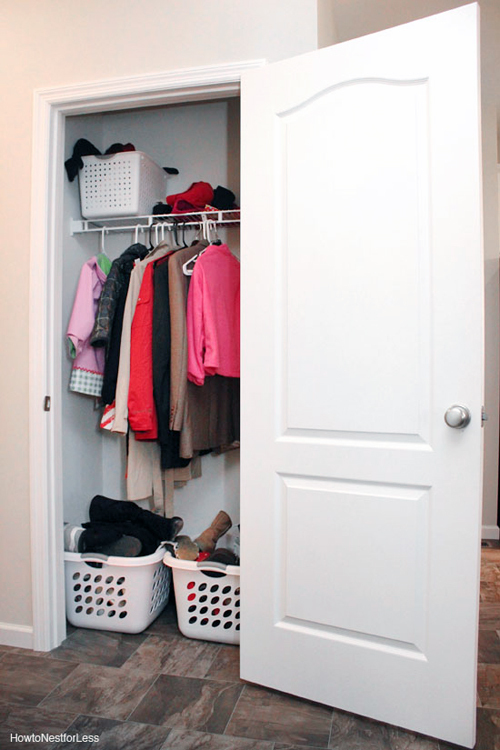 It is often overlooked, but it is one of the easiest and fastest ways to make the most of your closet space. 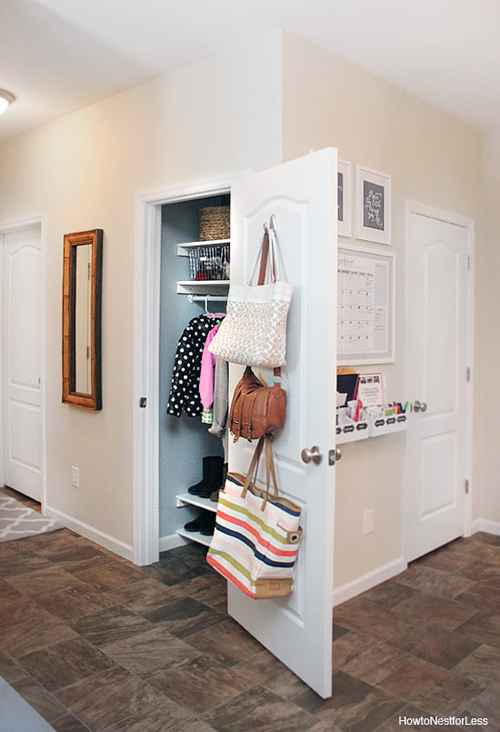 If you currently have a bi-fold door and are lacking in the closet storage department, it really would be worth it to update the door with a swing open option and add hooks, shoe pockets and over-the-door racks. Finally, I can't gush enough about her basket selections. 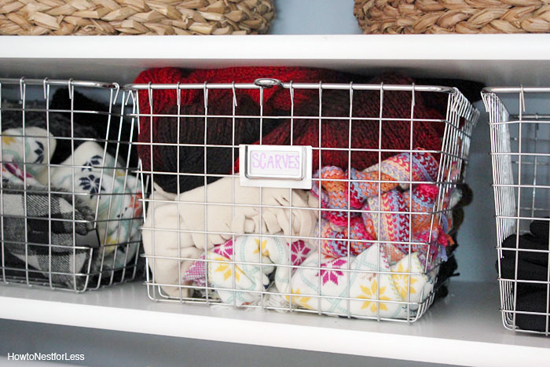 The wire baskets are perfect for letting her winter items air out while the woven options conceal unsightly clutter. 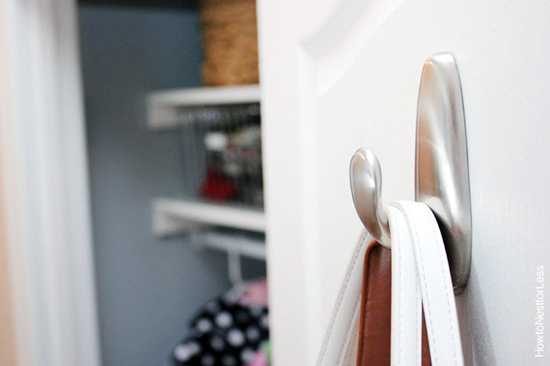 The combination of the two really streamlined the look of her closet and added a little texture, while giving her timeless storage for many years to come. And if you are like me and wanted to know about that amazing setup she has going on behind the closet door, you can find her command center post here. A giant, warm, iHeart thank you goes to my organizing loving friend Erin, for sharing her inspiring closet update with us today! 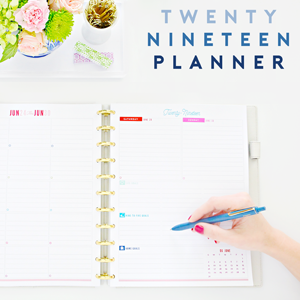 She has many more great tips on her blog, so head on over and be ready to feel inspired! I love the paint color in the closet. Very unexpected. I don't know how I haven't noticed people doing this before. I will definitely copy this! She did such a great job! It does look so much wider!! 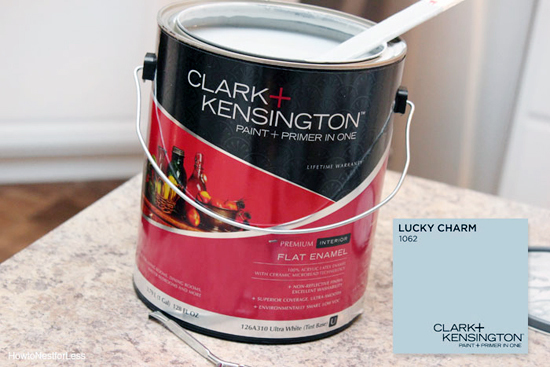 I love the idea of painting the inside of the closet! 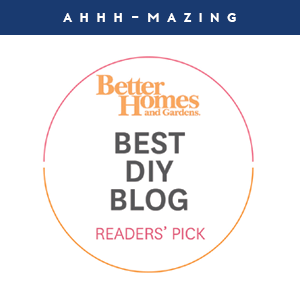 Thank you so much for the lovely feature, Jen! I truly appreciate it!! 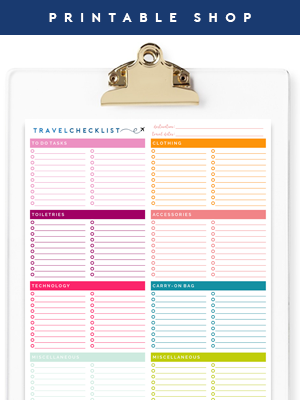 I love how organized everything is! Thanks for your closet inspiration, Erin! 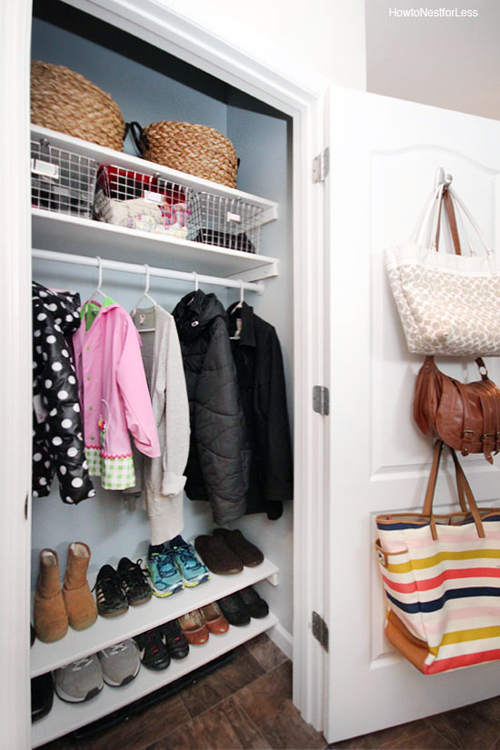 We did something similar to our hall closet. 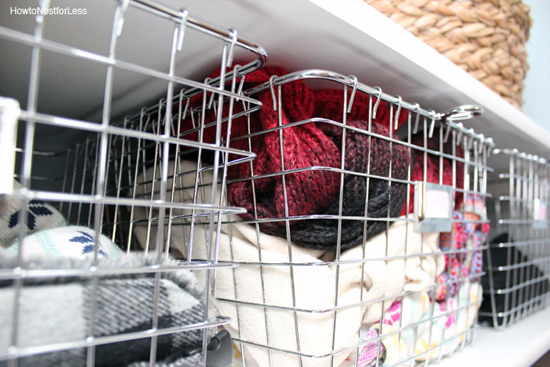 Added the extra self for more vertical storage and the shoe racks on the floor of the closet and it really made a difference (especially the extra shelf - we also used baskets to sort our hats, scarves, and gloves). Little changes that made a big difference! Ahhh...this looks so fantastic. I love the different baskets and the shelves for shoes, that is a great idea, one that I think my kids could keep up with! Where can we find the wire baskets, please? Lovely closet!!! We are needing to do something similar and would love to know where you got those wire baskets! Great organization! I esp. like the pop of colour and the hooks on the back of the door! 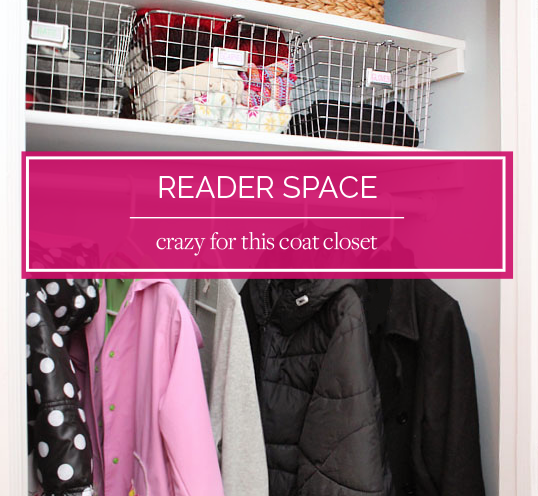 I'm in need of redoing our coat closet, and this post has provided some much needed inspiration! Looks great! I wish all my closets looked like this haha some day! Totally stealing this entire closet idea! Thank you so much and Happy Holidays!